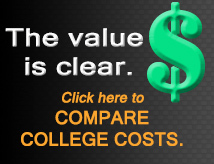 Greenville Technical College is a great value. You could pay two to three times as much at a public four-year college, and much more at a private college. Greenville Technical College uses a linear tuition and fees model in which students pay by the credit hour, no matter how many hours they take. This structure was adopted by the SC Technical College System, and is now in place at many of the system’s colleges. To receive the full financial aid award, you must be enrolled in 12 credit hours or more. Some programs may have additional costs such as lab fees, liability insurance, background checks and exams. Specific fees are listed in the Lab and Course Fees 2018-19 (pdf). Returned checks will be submitted to the Solicitor's Worthless Check Unit at a minimum cost of $121. As of July 1, 2016 there is no application fee. Any previously paid application fees are non-refundable. eRate tuition is offered to any student classified as an out-of-state student, enrolled exclusively in online courses. Students enrolled in courses delivered in formats other than online (i.e. face-to-face or blended) will NOT be eligible for the eRate specified in this guideline and will instead incur traditional out-of-state tuition rates. For example, if an out-of-state student is enrolled in 3 online courses and one face-to-face course, he will be charged out-of-state rates for ALL courses. Out-of-state students do not qualify for Lottery Tuition Assistance. All other fees (i.e. technology fee and course fees) apply. Let us do the math with this calculator, which estimates your costs and deducts your financial aid based on information you provide. The cost of books is not included in tuition costs and varies by class. For details, access this complete list of the current books in use and their cost. Student housing is not included in the tuition and fees listed. For information on student housing, please visit www.gtechhousing.com. Most forms of financial aid such as Lottery and Federal Stafford Loans have a 6 credit-hour minimum. Financial aid funds are based on official dates of attendance and will be reduced or revoked for withdrawals. To receive any form of aid, you must have a completed and verified FAFSA on file. When you change addresses, update your records immediately through WebAdvisor via GTC4me, the admissions office or any satellite campus. A correct address on file will ensure that any refund checks will be properly delivered. That is also the address we will use for account statements and bill notifications. Please note: A change in address does not change your status for in-state tuition or in-county tuition. See below for full explanation. The initial determination of one’s resident status is made at the time of admission. The determination made at that time, and any determination thereafter, prevails for each semester thereafter unless the person’s situation changes. Residency status may not be acquired by an applicant or student while residing in South Carolina for the sole purpose of enrollment at the college. Persons applying for a change in resident classification must complete a residency application and provide supporting documentation to Admissions at least three weeks prior to the first day of classes of the current semester. The change of residency is not retroactive and never results in a refund.